Hope it's not too cold where you are. It's been quite mild here in Essex, but windy and rainy too. Mum and I prefer colder, crispier days. I hate the cold, but at least I get to snuggle up with Mum more to keep warm and in return, this calms her so I think we both get a good deal. So Valentine's Day is soon upon us and I guess it means most of you will be sharing your sweet romantic art today. But Valentine's Day isn't just for romantic couples! 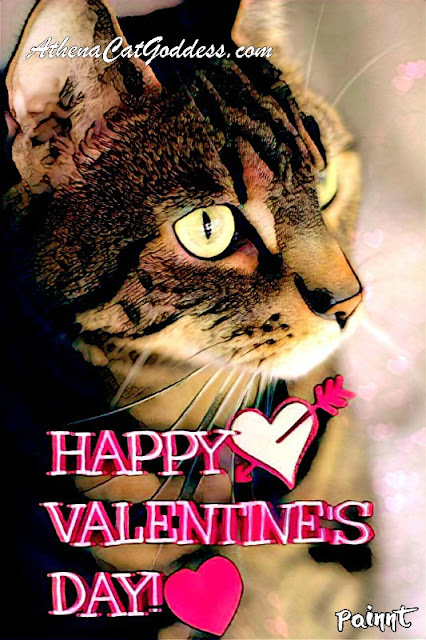 We like to celebrate all kinds of love - in particular, the love bond between pets and their people. We hope you all lovely Valentine's Day on Thursday! For our Caturday Art today we used PicMonkey for the hearts and the free version of Painnt. Disclaimer: This post contains affiliate links. Full disclosure here. I really like the Magic Ultramarine Effect! We come by every week and you always have something beautiful to show us. Of course, Athena is gorgeous on her own - so maybe that helps? We had lovely warm weather for the past few days, but it's cold again! The Valentine'a art is lovely. It has turned very mild again here also, but a lot of storm force winds which have brought several trees down. Those are very, very pretty! Well we totally forgot Valentines and will showcase it next week. Today is all about Fenris (and Mom). It's their Gotcha/Birthday. We think Daddy may be in the doghouse it looks like HE FORGOT. Athena, you are beautiful in your Valentine greeting cards - Happy Valentines Day! Those are both really pretty. We forgot all about V-Day. Happy Caturday Art Day, Athena. We are pretty cold here today with lots of wind. Everyone here at the office is very excited that Valentines Day is almost here. Thanks for sharing the beautiful artwork. Have a wonderful weekend. Maybe my human will make me Valentine's dinner this year, instead of running off somewhere. 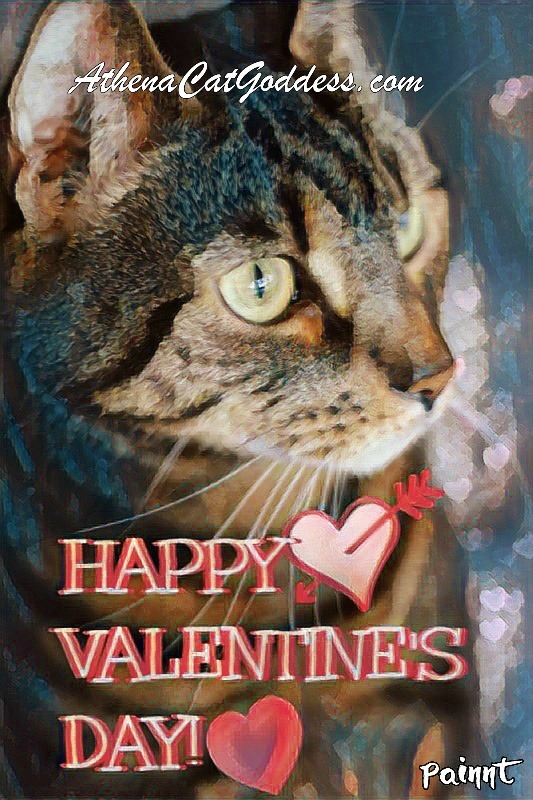 We love your Valentine's Day cards, Athena. We agree, Valentine's is good for celebrating all kinds of love. So Happy Valentine's Day to you both! Hugs! We have cold and snow, so Valentine's Day is a spark of warmth and light in the drab winter!